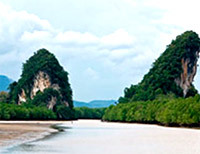 The trip starts from Phuket as on the Top Private Trip to see unseen places of Krabi. 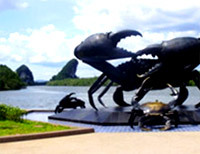 By the private tour can provide you to visit every interesting thing to see in Krabi. This should be the best time of your holiday experiences. 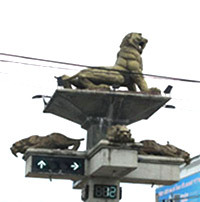 Just see the highlight pictures and detail of the trip and do booking. Suwankhu-Ha Temple, the temple is in the cave, the cave is in the mountain, the mountain is in the Safari. And there is a great Golden Declining Monk in the cave. We will never miss the "Purity Waterfall in Krabi." We need you touch the cold fresh water on this nature place (Than Bok Koranee National Park Waterfall). Elephant Trekking: along the stream though the jungle, sighting the wild nature along the way. Tiger Cave Temple: The place you must see if you have a chance "Having Holiday in Krabi" we included in this package for you already. Real Nature Mineral Hot Water come out from under the Earth and flowing from the Mountain became to be the Hot Spring Mineral Waterfall. It is a wonderful bathing here. 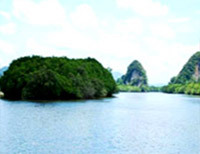 Khao Khanab Num (Khanab Num Mountains) This Mountain looks like to be the meaning of Krabi. The people who visited Krabi they must take a picture this mountain to prove that they have been this province. 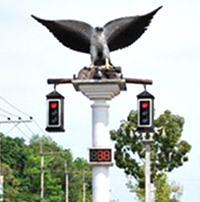 The traffic Light Sculpture will be located at the big Corner in the center of Krabi Town. 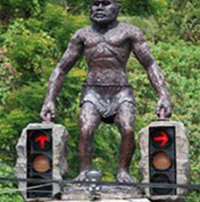 There are so many Beautiful Sculpture Arts from the high level artists. Our Private Minibus will transfer you from Hotel.